The Overland wooden vestibule V&SAR joint stock mail sorting carraiges ceased about the time of the first World War. The official removal of Travelling Post Office operations on the Adelaide to Melbourne service was on 28.6.1917. Originally four wooden mail vans, each 60'2" long over their timber frames. Bulk Mail carriage, original capacity 20 tons, tare 27.3 tons, built Newport workshops. 23.10.1907 Issued to service as "1 EEB". 11.7.1923 Destroyed in a derailment at Glenorehy, Victoria. Overland Bulk Mail carriage. To replace the D van destroyed at "Callington", Islington workshops built an all steel replacement vehicle "1 D" of 25 tons capacity, but weighing not less than 37.5 tons. The body of light gauge mild steel, rivetted to a centre truss type underframe is 60'1¼" long and 10' wide. It rides on two four wheel cast steel equalized bogies at 40' centres. The curved and eliptic roof is pitched 13'2" above rail level. 1937 Repainted Royal Blue with gold lines for use on the "Spirit of Progress" whilst a special mail van was built. - Later repainted bright red, but reverted to a dark red. - Became the property of Australian National. 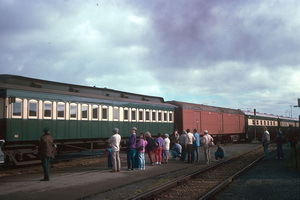 21.12.1907 Issued to service as "2 EEB" (owned by the Victorian Railways rather than being joint stock). 1924 Transferred to V&SAR joint stock roster. 27.12.1929 Destroyed in a derailment at Callington. Bulk Mail Sorting carriage, original capacity 20 tons, tare 27.3 tons, built Newport workshops. 10.1907 Issued to service as "1 EES". 1910 Recoded as "3 DS". 28.3.1928 Converted to Bulk Mail van. Recoded "3 D". 12.12.1972 Withdrawn as Joint Stock. 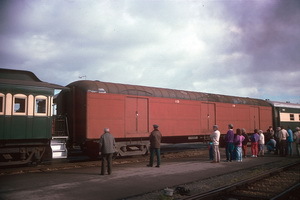 1977 Still in use for mail carriage working to Port Pirie on an as required basis. 24.3.1908 Issued to service as "2 EES". 1910 Recoded as "4 DS". 28.3.1928 Converted to Bulk Mail van. Recoded "4 D".